A Year of Being Here: Mary O'Connor: "Good Days"
Low light before sunrise, distant birdsong, smell of damp earth. a long slow waking, and comfort in the bed. just to have the words coming, the words in order. where my bread and apples wait. healthy as a trout. His organized joynts, his azure veins. Later, sweet light shrieks of kids on a trampoline. a book, music, the life of the spirit. what I’ll never know in the hands of God. That something lost with cancer treatment? It was really something. Here. It’s back. 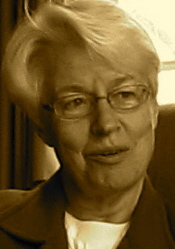 "Good Days" by Mary O'Connor, RSM. Published here by poet submission. © Mary O'Connor. Art credit: Untitled image by unknown photographer (originally color). 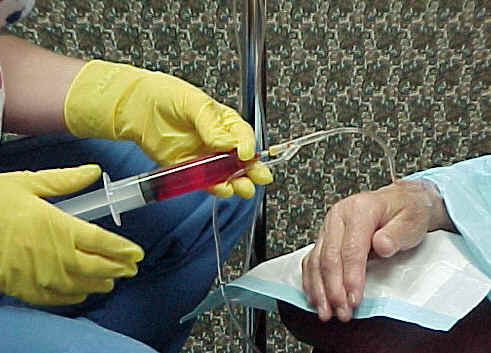 Caption: "Karen slowly injects the Adriamycin into the IV. It takes several minutes to inject." Curator's note: In her submission the poet wrote, "On the good days during the chemo cycle, life wasn’t just good, it shone! Everything stood out in [high definition]. I remember the first time I got glasses when I was 13 and had been short-sighted for years, the way things just came into focus. Amazing. It was like that." I actually hyperventilated reading this poem. Utterly amazing.